There are so many bottles to choose from for your baby these days. We all want the best for our little bundle of joy don't we? Twistshake bottles want you to be able to give your baby the attention and time he/she deserves. The Twistshake bottle contains an innovative mixer next that dissolves clumps in your baby's formula. These bottles come in great colours and very easy to clean. 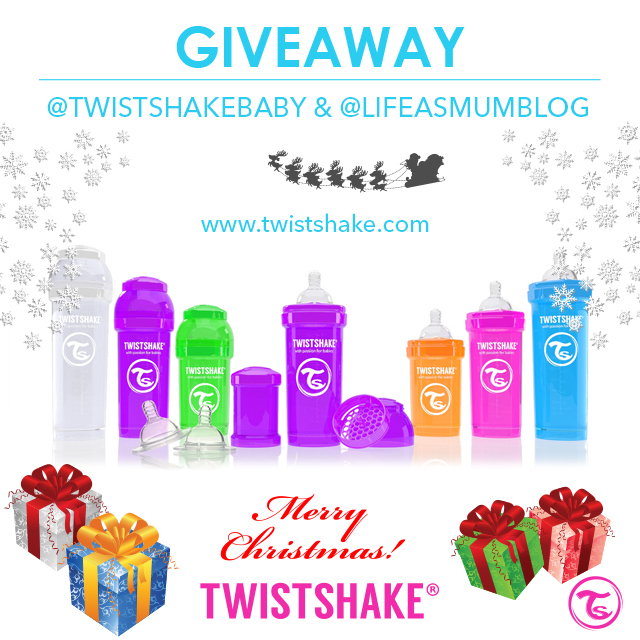 Life-As-Mum has teamed up with Twistshake Bottle and giving one lucky winner a chance to win x1 Twistshak bottle with the included powder box and mixer. They are also giving away an extra 2 pack powder box. For your chance to win this amazing bottle all you have to do is enter the raffecopter below and read the Terms and conditions. 1. Prize is x1 (one) twistshake bottle, powder box, mixer and an extra 2-pack powder box. 2. Giveaway ends 16th December at 11.59pm. 3. Winner will be notified via e-mail within 3 days. 5. Prize is provided by Twistshake. This sounds really practical and looks pretty. Fab giveaway. Entered with thanks.